I fell in love with peaches when I lived in Athens, Georgia. Georgia is a peachy place. There wasn’t a roadside stand I wouldn’t stop at if there were buckets of peaches. I don’t know how many I ate over my five years in Georgia, but I am sure they lost money when I left. Chez Panisse, a top restaurant in Berkeley, California famously served a peach as dessert. This meant that the restaurant DIDN’T earn the highest French starred rating because the dessert was considered “too simple”. I wonder if the reviewer tasted that peach. Now is your moment to buy peaches. Go get them and if you can hold off from eating them immediately, you should grill them. I make sure my grill is clean from whatever else I have been grilling. I heat the grill for about 10 minutes on high and then I scrub it with a wire brush. I toss the peaches on and my family waits impatiently – “Peaches done yet?”. The cooked peach explodes with flavor and the texture is like pudding. I serve them with whipped cream or nothing at all. Have you tried grilled peaches? Heat a grill on high for 10 minutes and clean with a wire brush. Cut peaches in half and remove pits. Place peach flat side down and grill on medium high for 3 minutes. Flip over and grill for another 2-3 minutes until peach is hot. Enjoy immediately! I also LOVE good peaches! In my opinion, New Jersey has some of the best. Love your blog and your book! My mom does this too but with a slight variation. She grills them, puts a scoop of vanilla ice cream on them, and sprinkles with cinnamon. Oh Snack Girl, you have rescued me yet again!!!! I have a BBQ party to attend on Saturday and was wracking my brain for a delicious, easy, healthy, low calorie dessert... and ta da! Snack Girl to the rescue yet again! What a simple idea, and I bet nobody at the party ever thought of grilled peaches. Thanks for another wonderful idea. My taste buds and waist band alike thank you!!! Love peaches...my vote is for Colorado Peaches!!! I'm a Southern California girl! Some of my favorite memories are our Summers spent driving to Berkley to visit family as we would pass the peach farms! Tons and tons of peaches as far as the eye could see!! We'd load up and have everything you could think of with a peach theme! 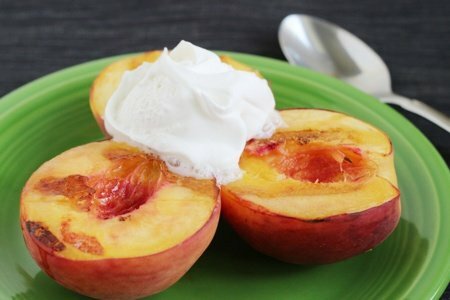 Grilled peaches with my moms freshly made whipped cream is still one of my favorites!! My brother moved to Georgia a few years ago and raves about the peaches there as well! I love Cali for the best local produce I can get my hands on at any time! Grilled peaches rock alongside grilled pineapples and green onions with 100% grass fed steak...no sauce, just the fruit! Amazing!! I just have to say that Michigan peaches are really delicious too! I love peaches! Thanks for the great idea. Unfortunately there is a recall on all stone fruits, including peaches, right now in Southern California, due to a listeria outbreak! I wonder how long it will be before it's safe to eat peaches again! Oh my!! !Finally got around to trying this...I think that I've died and gone to heaven!!! !